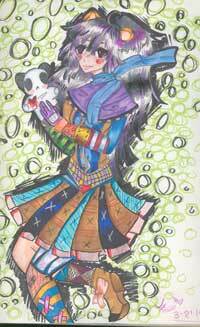 Shastina had a passion for drawing in the Anime Art style since she was 6 years old. Anime means Japanese cartoons. Each amine artist develops their own style as they grow in the anime art style. Shastina said that in her early grade school days, she liked to draw the fashion figures with big eyes, glossy hair, and often holding stuffed anime animals. She currently is a senior in high school. 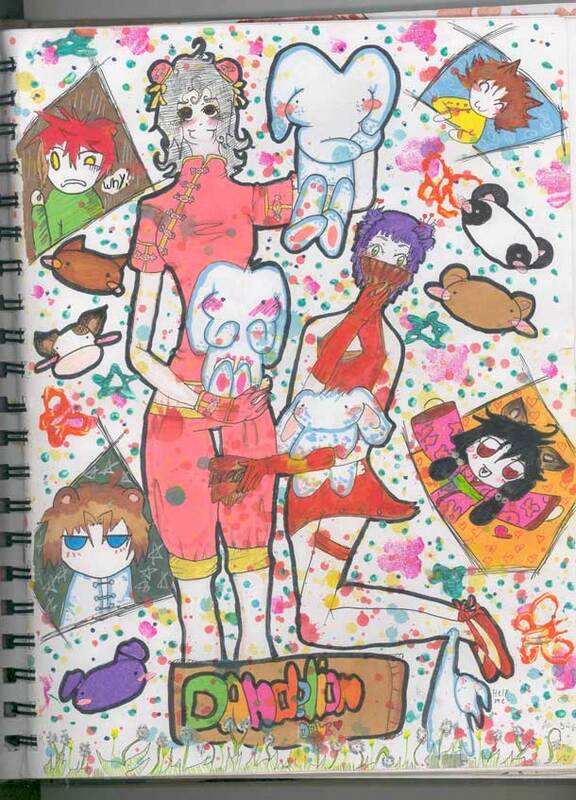 Now, her Anime drawings have a more realistic, anatomically correct western influence. Shastina said she often gets her inspiration from the older Japanese ink drawings and Walt Disney characters. She is definitely coming into her own in developing her anime art style. 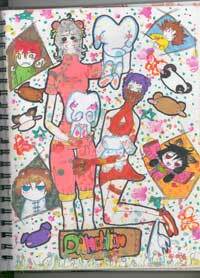 Anime drawing with several characters. Look closely and find all the bunnies. 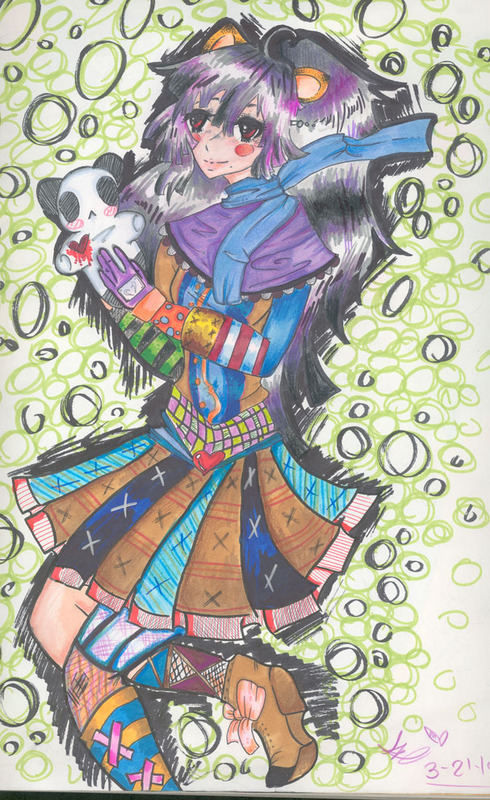 Whimsical Anime drawing of Shastina's character holding a panda. “Dirty Bunny” was one of her favorite anime characters and can be found in many early drawings. 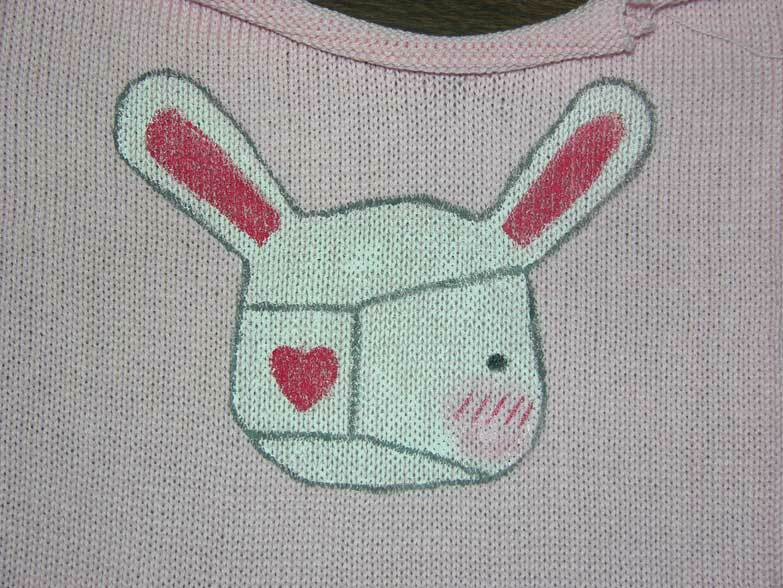 Go to the online Knit Tree Store to find a “Dirty Bunny” Toddler knit cotton pullover. 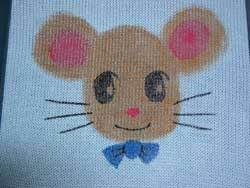 “Mister Mouse” knit cotton 2T pullover can be found there too. The history of Anime art is quite interesting and dates back to before World War II. “ In 1951 - Osamu Tezuka created the milestone manga, Tetsuwan Atom or Astro Boy, as it was known in the US. As a result, years later he became a pioneer in anime, and was the man responsible for the success of anime and manga worldwide.” For more history on Anime Art and a great time line on the development of this art style go to Novaonline. 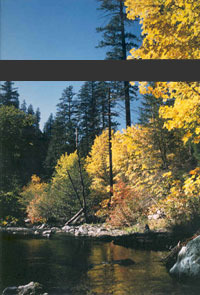 The above quote can be found on this web site. Native Foot Baskestry Motif Stencil painted on a cotton 6 month sweater. When Shastina was in 6th grade, she entered into the Little Knitters Program and started learning the first traditional knit projects: slippers, scarves, and baby blankets. It was a natural progression for Shastina to want to apply her love of anime art drawings to some kind of knitwear products. 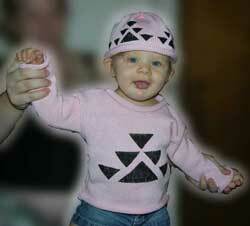 Knit cotton baby and toddler sweaters were the perfect place to start with her anime animal characters. Research on painting on knits became the next challenge for the Little Knitter Program.. The people at Dharma Trading Company gave us great advice on books, videos, and painting supplies that would be helpful in our next adventure. It was very important that the paints were non toxic and safe for babies and children. They also had to be washable. The Jacquard Textile Paint, Lumiere and Neopaque Paint, fabric painting brushes, vanishing painting markers, stencil cutting tool set, and a Grip-n-Grip No-slip Mat were all ordered from Dharma Trading Co. Now, the Little Knitters had supplies to start their Painting on Knit Cotton Clothes adventure. Another Little Knitter, Danielle Nani, now heads the projects for the Little Knitters and The Baby Corner Knits. She is a ‘stay at home mom’ with two daughters under the age of 2. So it was natural for Danielle to specialize in knit baby clothes. Danielle also had previous experience working with stenciling and painting on Tee Shirts, so she experimented with stencil painting on a cotton baby sweater and hat for the Native American line for Darlene Marshall. The pink sweater and cap with roll hem has the Goose Design. The white sweater and hat with the Foot Design has a 1 x 1 rib trim. The first step to the knitting project is to select ‘the canvas’ to be painted upon and the yarn to use. Cotton is a good fabric to paint on and is a great natural fabric for baby wear. Read our article “Why Cotton Baby Clothes”. 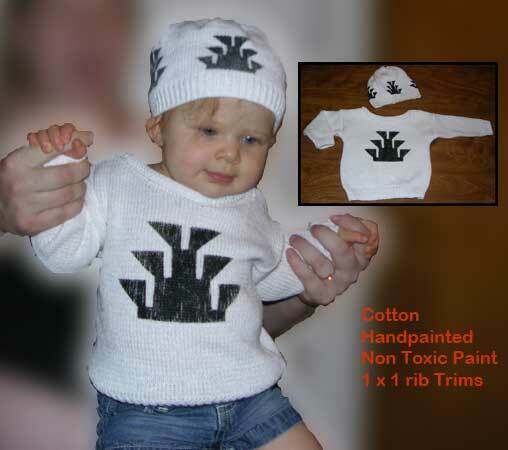 The round neck cotton knit baby pullover gives the largest space for the painting. This is also a great sweater for any baby or toddler because the neck opening is large and stretchy enough to go over the baby’s head without the need for shoulder opening with buttons. The drop shoulder style gives large arm openings for ease of putting the sweater on the baby or toddler. After selecting the cotton yarn fiber and the drop shoulder, round neck body pattern, the sweater and cap pieces are knit. Each knit piece is then first steamed in preparation for the painting process. 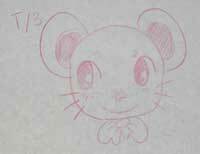 Shastina's Anime sketch of Mister Mouse. 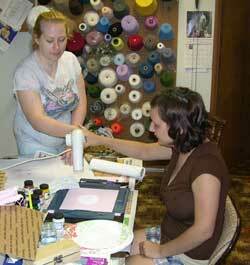 Once Shastina saw the finished knit front piece, she could determine the space that she had to draw on. Since Shastina is an anime artist, she would draw her design on the cotton fabric freehand style, not stenciling. Therefore, each sweater set will be a One of a Kind knit Anime garment. 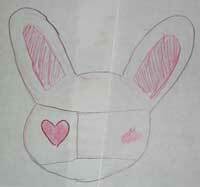 Shastina made several preliminary sketches to pick from for her first baby and toddler projects. The designs could not have as much detail as her drawings because there is not a lot of space on a newborn through toddler size sweaters. Another factor to consider was the final cost of the knitted sweater. 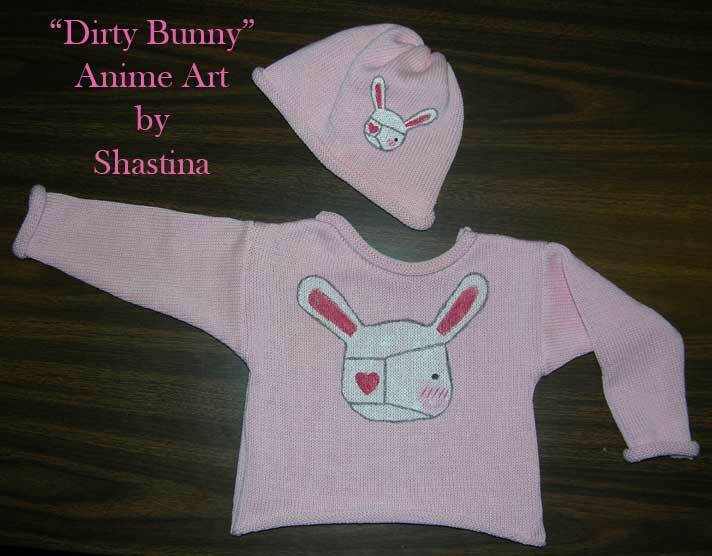 To keep the sweater and hat set to an affordable price, Shastina decided to stay with a simple anime design for the baby line. For the adult sweaters, Shastina could do larger more detailed sketches. These would be more Wearable Art knitwear items. Shastina paints Dirty Bunny's face details on the cotton baby sweater. The cotton knit fabric was securely placed on a Grip-n-Grip No-slip Mat and sewing weights were put on all the knit edges to hold the fabric firmly in place. 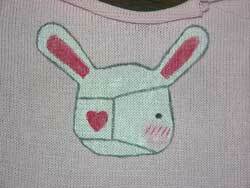 Shastina chose her favorite‘Dirty Bunny’ anime animal art for her first size 2T toddler sweater. 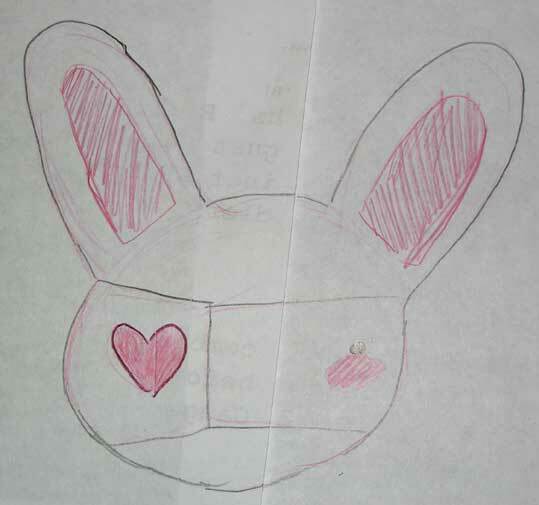 Shastina used the vanishing purple painting marker to sketch the larger background bunny face. It is wise to do one color at a time, and one part at a time because the vanishing purple sketching pen will disappear. Since the face was round, Shastina used a round sponge painting brush to paint the white paint on the cotton knit fabric. It was found that drying this first layer with a hair dryer, allowed the next layer of white paint to be added quickly. This painting / drying process was important to prevent the thickness of paint from bleeding through the fabric to the back side. After the background color was dryed, Shastina used the finer paint brushes for the face detail work. She started with several of the primary paint colors and from there Shastina mixed her own paint colors on a paper plate to create the colors she wanted for her anime art. 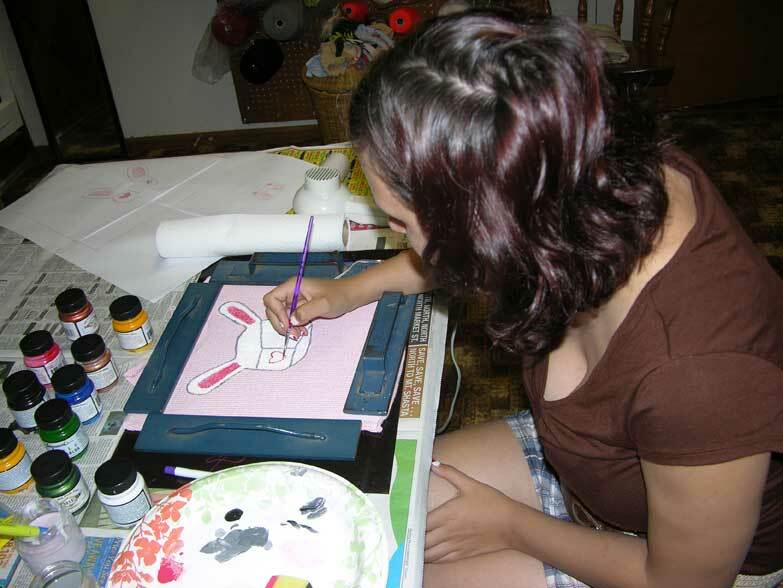 The Painting of Anime Dirty Bunny has to dry before assembling the knit baby sweater. 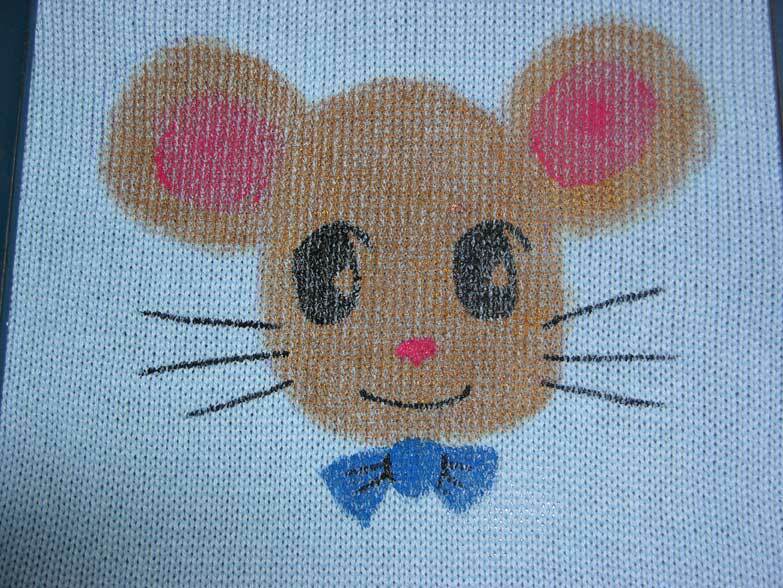 The Painting of Anime Mister Mouse has to dry before assembling the knit baby sweater.. The painted fabric should be left to dry for at least 48 hours before the process of setting the paint for wash and wear. Dirty Bunny and Mister Mouse are done drying and are now ready for the next step. 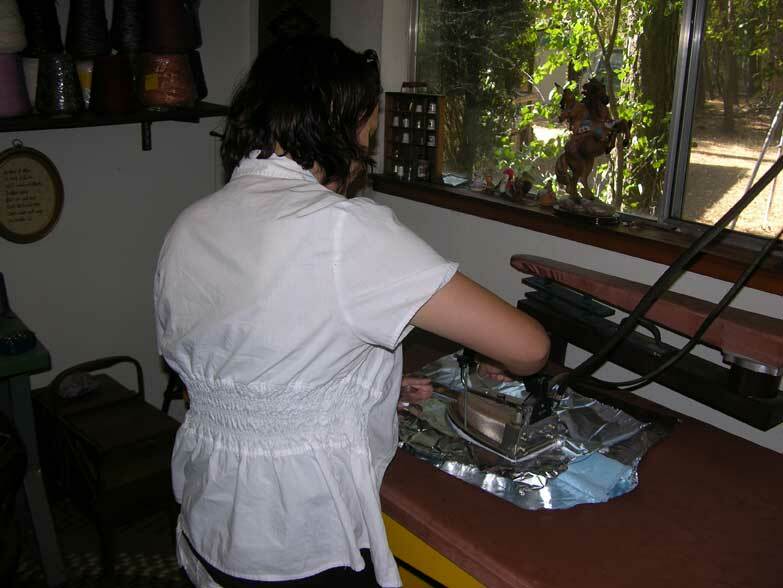 Pressing on the tin foil with an iron to heat set the paint. Here is a simple way to heat set the painted cotton fabric. Lay a piece of tin foil down with shiny side up. 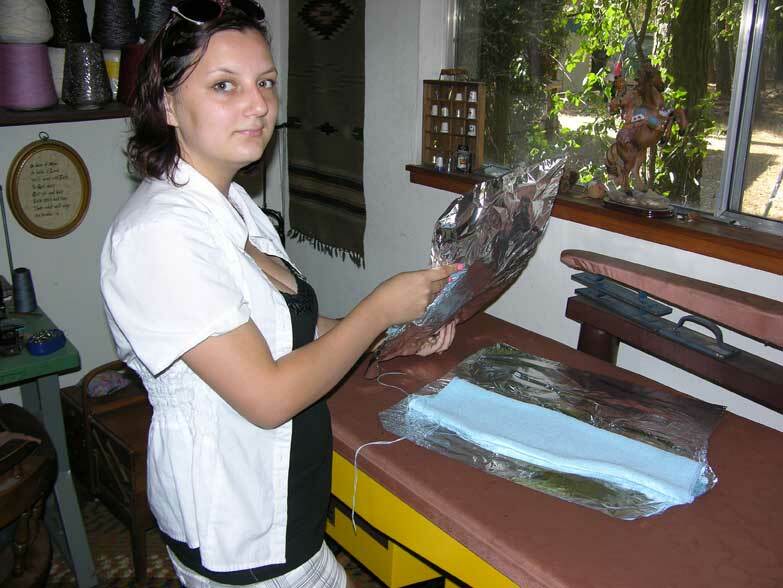 Lay the cotton painted side of the fabric on the tin foil. Note that the wrong side of the cotton fabric is on top and facing you. Then lay another piece of tin foil on top of the cotton fabric with the shiney side against the cotton. With an iron on high heat (no steam) press over the painted area moving the iron for about 25 seconds. Be careful not to do it too long or you will scorch the fabric. This process sets the paint into the fabric so that you can wash the garment. I would still be careful and either hand wash with the garment turned inside out and lay flat to dry. Or if you machine wash, use cold water, turn inside out and wash on the gentle knit cylce. Lay flat to dry. Shastina sews her knit cotton sweater pieces together. There are several methods of assembling the garment. One can hand sew it together with the Mattress Stitch or link it together with a linker that chain stitch crochet the seams together or sew it with a sewing machine. Each way has different advantages. In this case with baby knits that we want to keep the price affordable, the item will be sewn on a sewing machine. The shoulder seams are sewn first. At that point the seams should be pressed open. Then the arm caps are sewn onto the bodies. Again the seams are pressed open. Finally the side and underarm seams are sewn and those seams are pressed open. Knit Cotton Baby / Toddler Sweater and Cap featuring anime painting of dirty bunny. Go to The Knit Tree's online store to buy one. 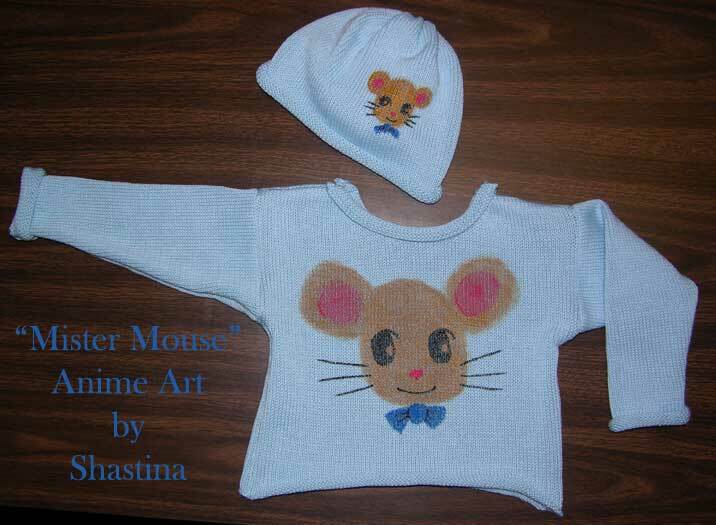 Knit Cotton Baby / Toddler Sweater and knit Cap featuring anime painting of Mister Mouse. The final step is trimming all the threads and yarn ends, hiding them in the seam allowances. A final steam is done on the finished sweater set and it is ready for the photography and little models if available so that this adorable outfit can be put on The Knit Tree’s online catalog for you to purchase. The Dirty Bunny Knit Anime Hat and Mister Mouse Knit Anime Hat are each sold separately too for those that just want a small wearable art gift. This definitely is a unique gift for any baby / toddler and a great family keepsake. Since the art is done freehand, each one is a ONE OF A KIND ART FORM ~ A work of art made with a love for anime art and crafting a special knit garment. I personally look forward to seeing this young artist enjoying her special talent for years to come and I hope you support her endeavors by buying one of her Wearable Art Knit Anime garments. Watch for One of a Kind Knit Anime Baby Sweaters and Hats in sizes: newborn, 6 months, 2T, and 4T with different Anime characters painted on the cotton knit fabric. Special Wearable Art Knit Anime Garments are also planned for adults!